Over the past 32 years I have served as a wedding alterations specialist serving Virginia and parts of North Carolina. There have been some questions that frequently came up from time to time in my line of business. Maybe below you will find an answer to a question you may have. The point I want you to know is... "if you don’t match the designers' ideal figure proportions exactly you should expect to need bridal alterations." Are there some gowns made to measure? Yes, in some instances some manufacturers will do some made to measure areas on a wedding dress. Find out more about this on the next page. How To Pick The Right Sewing Alterations Specialist For Your Wedding Dress? Learn what you need to find out to see if a sewing professional qualifies to work on your wedding gown. Your Bridal Dress is too Small or too Big Can this be Fixed? When you have a gown that is more than one size too big or too small what can be done? How to prepare for your first bridal alterations fitting at the bridal shop? Independent Wedding Dress Alteration Specialist or Bridal Shop Seamstress--Which Should You Choose? There are some compelling reasons why you may want to use wedding dress specialist instead of to bridal shop seamstress. Consider these reasons. Instead of a Custom Made Wedding Dress Have One Re-Designed? Did you know that you can add or subtract details from your gown and make it more your personal style? Here are some suggestions you might consider. Altering A Strapless Wedding Dress: What should your wedding alterations specialist do to your strapless gown in order for it to fit you properly? Pregnant Bride To Be: What You Need To Know About Your Wedding Dress Alterations. Should you purchase another dress or fix the one you have? You have the option to do both. How To Cut Your Bridal Alterations Costs While Selecting Your Gown There are some things you should know when looking at bridal gowns that can cut your costs dramatically! Read this article to learn more. Corset Wedding Gowns - Converting Your Zipper Back Closure To A Lace Up Can you convert a zipper closure into a lace up back? Yes, it can be. Learn when this can be done. Wedding Gown Alterations And Water Retention - Beware! If you think you could have this problem here is what you need to know before you get your gown altered. 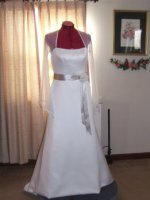 Wedding Dress Bustle - Read these tips and see these pictures on bustling a wedding dress. Desiree's Custom Sewing Specializing in Bridal & Wedding Alterations serving the entire Hampton Roads Area in Virginia including: Hampton, Newport News, Yorktown, Poquoson, Williamsburg, James City County, Norfolk, Smithfield, Suffolk, Portsmouth, Chesapeake, Virginia Beach, VA. And as far north as Richmond, Va and as far south as parts of North Carolina.